Thanks to some bad weather here, I’ve had more time to read the last few days than I usually do. 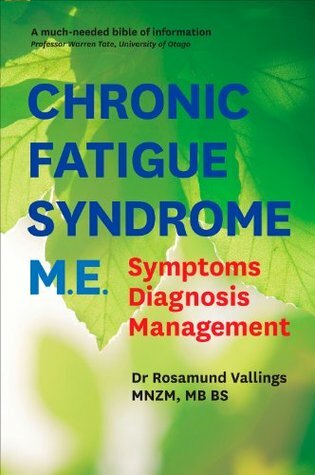 I’ve now finished reading Dr Rosamund Vallings book, Chronic Fatigue Syndrome M.E. : Symptoms, Diagnosis, Management. “… a much needed bible of information” (p. 10 Vallings, 2012). Having read through the whole book, I have to agree with Professor Tate that this has been written in a way that is both comprehensive and accessible. However, there are a few chapters where I felt additional information could have been supplied. For example, the chapter “Managing Relapses” provided an outline of different issues that may lead to relapses and suggested for people to watch out for these issues. I would have liked to have seen a bit more information on how to avoid the issues and how to plan for issues that can’t be avoided or are desired, such as starting a family. Like The Complete Fibromyalgia Health, Diet Guide and Cookbook, this book is a great introduction to a very complex and difficult to understand condition. The introduction and information provided about what ME/CFS is and how it affects an individuals body were very comprehensive and provided a lot of information I found useful, even after my ongoing research into the conditions I’m facing. The parts I found less useful, or at least less comprehensive, were the sections on Managing and Living with ME/CFS. Although the information provided in these sections provide a great starting point for someone newly diagnosed or considering a diagnosis of ME/CFS, I felt there could have been more detail on the actual actions people living with this illness could take under each of the areas covered. I understand that this may be because little is known about the actions and research is continuing at this time. Dr Rosamund may have wanted to keep to information that would most likely remain relevant over an extended period of time. Chronic Fatigue Syndrome M.E. : Symptoms, Diagnosis, Management is a long book with 342 pages of detailed and helpful information related to ME/CFS. As someone suffering from the condition, I found the length to be an issue because brain fog and fatigue limited the amount I could read at one time and my ability to remember what I had read. The book is broken down into manageable chapters, however I always wanted to keep reading even when I had reached my limit. On some days brain fog made it difficult to even read a page, let alone a chapter of the book. This book is, as described in the forward, ” a much needed bible of information” on an illness that can be difficult for anyone to comprehend. It is a book that anyone with any connection with ME/CFS should consider reading; those living with the condition, those who know someone with the condition, and doctors working with those people would benefit from the information in this book. The length and size of the book may be daunting for individuals living with ME/CFS but it is worth the effort. I would recommend taking the time to read a few pages or chapters at a time and beginning with the chapters that you feel most relate to your immediate concerns. If you suffer from ME/CFS have you read this book?